We’re all developers here at Cloud 66 and we love learning about new tools that make our lives easier. One such tool is Nitrous.io, which makes spending hours on endsetting up local development environments a thing of the past. Working in the same environment as your team makes it a lot easier to replicate bugs and get to the root of a problem. The screenshot above shows the IDE - text editor, chat and console. Ultimately, a tool like Nitrous.io cuts the cost and time sink associated with having a non-standard development environment. We believe that you can achieve further synergies by using our services in conjunction - Nitrous.io takes care of your development environment and Cloud 66 helps you deploy and maintain your applications in the cloud. The screenshot belowis an example of a stack on Cloud 66 with 2 app servers, a database server (with backups) and a load balancer. 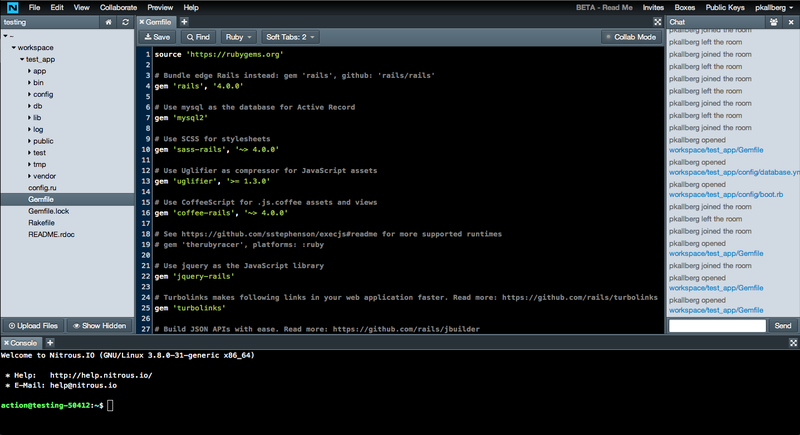 Push your code to your git repository. Create a [new stack on Cloud 66](http://help.cloud66.com/getting-started/your-first-stack.html). Initiate the toolbelt by running c66 init and follow the authorization instructions. There’s also so much more you can do with Cloud 66 - have a look at our features page and help pages for more.